I just got a VGA cable for my Dreamcast the other day. The picture is just plain yummy! Only problem now is that I need a two female RCA to a male 3.5mm adapter... I have one, but it's this stubby little thing that won't fit in the back of my TV set. One with longer wires would be more convenient. I'm waiting on RetroGamingCables finalizing their SCART cable, since it will have a switch on it to deal with games that use VGA and ones that don't, so no cable swapping! Seems they've embedded a bevy of options to allow for extensive tweaking of the MD/Gen's notoriously fussy audio output, and I love the way it looks. If I wasn't already so far down the analog-upscaling rabbit-hole, I'd consider picking one up. I'm interested in this as well as the Super Nt, although I can't really justify it outside of future-proofing my systems. Well, as much as you can with constantly shifting technology. I was looking at this a few days ago. I’m also pretty far down the rabbit hole of upscaling from an original console, but I was tempted. Shipping to Australia is $80US though, which takes it from “maybe” into “nope” territory. I justified the Super Nt two ways. 1) Only certain models of SNES have non-noisy video, and even those need a bit of soldering to be aces (point 1a was that despite having like three SNESes, none of them were that configuration). (You can see a comparison in this video I made.) 2) I had hoped it would get a multicore jailbreak like the Nt Mini, but clearly Analogue is going to do a whole line of these things and don't want to just sell one FPGA super system. So I built a MiSTer instead. It's really hard for me to justify a Mega Sg, because my JVC X'Eye outputs a pretty damn clean video signal, plus the issues with the Sega CD and lack of 32x support kinda bum me out. So yeah. But if you're not down the several-hundred-dollar-scaler hole, I definitely think it's worth it. Because I'm cheap/broke, I'm thinking of going the Mega Retron route. It's gotten good reviews and I've seen it for as low as thirty dollars. I can justify that expense for a system I already own. $190, not so much. I do wonder if I'd be better off jumping down the upscaler rabbit hole. Considering the Super Nt and Mega Sg would be $380+, I could get quite the scaler solution. The issue there would be SNES, though, since I do have three systems, but one has really bad diagonal lines that aren't much visible on a CRT, one with the vertical band (not that annoying), and a Mini that only has composite. I've got more Genesis systems than I can shake a stick at, though. The OSSC is only $150 from VGP and, honestly, if it had been the workhorse it is now when I got my Framemeister, I probably would have gone that direction (but at the time, the most it would do is line tripling, i.e. 240 -> 720). There are still some things the Framemeister is better at, and the lag is lower than what almost any TV will do on its own, but yeah, if you have a bunch of hardware already, the OSSC and a bunch of SCART cables is maybe a better move than two Analogue consoles (even if they are super cool). What's the verdict for stuff that isn't SCART? Is the Retrotink 2X worth it for composite/S-Video? There were mixed results in this thread, and I wonder if folks have any sort of extra thoughts now that it has been out for a bit. I have a SCART-to-component box that works really nicely for my Genesis systems, but I have noticed that my new TV doesn't handle the video smoothly, putting a hitch in the video that I wouldn't be able to stomach. Looks great on my old Sony Bravia, though. Not sure about how the OSSC handles it. The Framemeister does a respectable job of handling composite, but you can only do so much. I mean... my solution so far has been to mod the systems that don't do SCART. Yeah, there's that. Maybe that's a better route, especially since I have a couple of systems that need recap work at the same time. A bunch of nerds have made a significant upgrade to the version of Stella that runs on the Retron77. This might be the thing that gets me into one of these guys. New option for a backlit screen for the GBC. Optional VGA output. Looks dope, for those who still like to play their GBC games on a GBC. Neat! I've been tempted to get either a backlit GBA or GBC, mainly for playing something like Kirby Tilt 'N' Tumble. I think the GB Boy Colour discrepancies would bug me too much. John Linneman breaks down the DCHDMI and compares it to other options. It looks dope, but honestly, given that I already have an upscaler, I'm just planning to grab the RetroGamingCables.co.uk SCART cable when it finally becomes available. This is amazing. Someone figured out how to extract hugely better image quality from the SNES's mode 7. Pretty cool. Since the scaling is done to a flat background I'm surprised more emulators haven't supported this. That said I definitely remember whatever old SNES9x version I first downloaded defaulted to having gaussian filtering on for mode 7 scaling effects. That mode 7 thing is really impressive and I don't like it at all. In theory, increasing the horizontal and vertical resolution of a Mode 7 scene should be fairly simple. 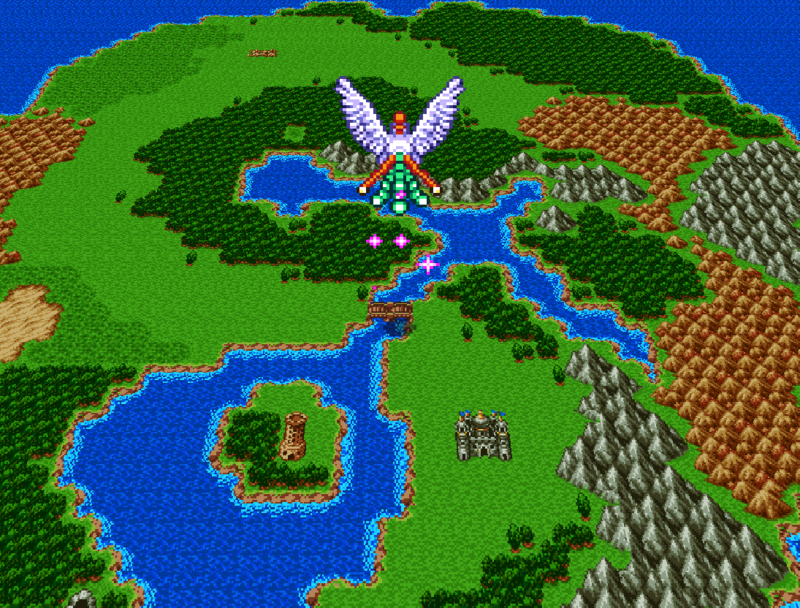 In practice, increasing the vertical resolution is complicated because most interesting mode 7 scenes modify the matrix parameters on a per-scanline basis, to achieve a variety of effects like F-Zero's perspective, Hyperzone's double perspective, SCV4's tube, Terranigma's underworld, Mohawk and Headphone Jack's title screen, etc. Creating a function to cleanly interpolate the matrix parameters for all the new, fake "scanlines" being added for all of these different use cases is likely a nontrival task. I'm curious if a (modest) depth-of-field effect could be added to the landscape scenes, and how that would end up looking. How could something that looks so right feel so wrong? I need to see some StarFox under that renderer. 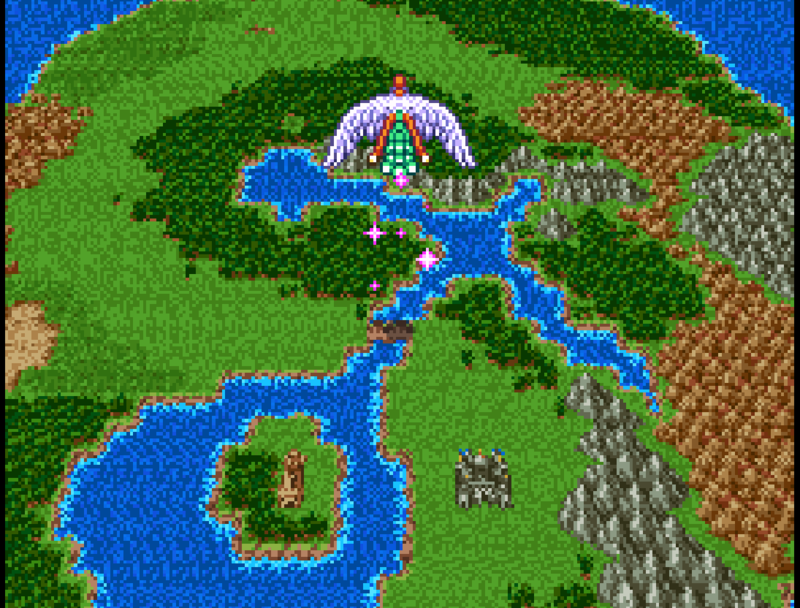 In Dragon Quest III you can actually distinguish detail with this mode 7 mod. It goes from a garbled mess to a respectably detailed 16-bit map. Would that do anything? Starfox uses a co-processor, not linear algebra trickery, right? I think there are already emulators that can render upscaled/higher frame rate Star Fox (framerate speeds the game up, though). High-framerate Star Fox I've heard of, but not hi-res Star Fox. At least as of a couple of years ago, nobody has written the code to make it happen, according to this old Reddit thread.